During the Fujimori regime the progressive left was decimated. ?Dissidents were quickly branded as terrorists and silences through defamation, marginalization or disappearances. 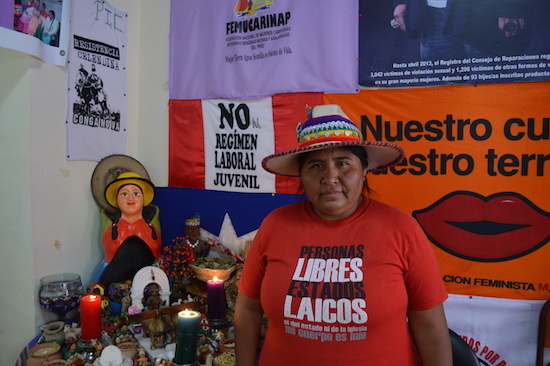 ?But far from being frozen in the past, the Peruvian left was kept alive in the periphery as clandestine student groups, indigenous people and women continued to organize. Following the downfall of Fujimori, these groups took to the streets never to lose it again. ?One of the first post-Fujimori organizations to emerge was FENMUCARINAP. 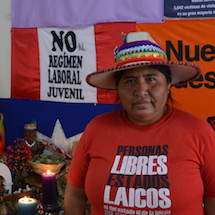 ?With the convoluted and farcical Peruvian election dominating the headlines, I decided to reach out to this woman’s organization and get a perspective and analysis of Peruvian society from the grassroots. Lourdes: FENMUCARINAP ?was born on August 18, 2006. Our main goals, which as an organization comprised of women is nothing easy, is control and defense of the territory of the female body which is often violated. Also for the political, economic, social and cultural empowerment as we [women] are the ones that sustain society and yet our work and contributions are not recognized. 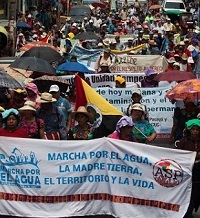 Finally, we also defend the sovereignty of our subsistence which is the land, water and seed, because for a campesina without those things has no choice but to move to city where she then becomes extremely impoverished. It’s been a hard fought struggle for recognition because in this country, as in other countries in Latin America, it comes up against patriarchy, machismo and sexism. Peru is politically illiterate. ?I shouldn’t be voting for the candidate that offers up the nicest words or is presentable, I should be voting based on their proposals for the development of my country. ?With that, having looked at all the candidates’ proposals for one that has a place for indigenous groups, we found the best one to be Veronika Mendoza. The other candidates just offer crumbs, enough to just hold back the masses. ?But with Mendoza we have worked, coordinated and spoken with since the start. ?Now, this is not to say that we are entrenched in politics, no, we are in a learning process. Too often we are labeled as anti-development, as if we do not want any development. We want development. ?At the same time we push for social justice, we cannot completely say NO to mining. ?Here are two contrasting examples from the North and South of the country: In Maquegua where I migrated from to Tacna over 20 years ago is Southern Peru Copper Corporation which arrived more than 50 years ago – it lives there. ?You can’t just tell them to get out because they are rooted there. What you do is confront them –“Hey, you have to pay me. You have to pay for all the damage you have done to the land because the land IS life”. ?You have to demand their compliance with the laws; that they stop poisoning and killing. Of course, radically speaking, we can demand they completely shut down but how many people who are working there will be left in limbo. ?This is why analyzing the situation through its social context is imperative. We suffer from multiple oppressions; we are women and indigenous. We used to see businesses put up help wanted ads asking for women with “good appearance”. Now, what did they mean by this? When we walk into a restaurant a staffer will often look you up and down as if you don’t belong there. We had a compa?ero a couple years ago who was thrown out of a business because he was wearing traditional clothing.